What is Help Animals India? 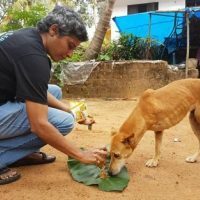 Based in Seattle, Washington, Help Animals India is a 501(c)3 charitable organization dedicated to improving the lives and welfare of animals in India. We accomplish our mission by raising money for dedicated Indian animal protection groups and advising them on how to improve their capacity to help the animals. Typically, the groups we fund are small to mid-sized charities that accomplish great things for the animals despite few resources, just as we strive to do. Help Animals India is a GREAT Nonprofit Top-Rated charity and a GuideStar Exchange GOLD Participant, reflecting our commitment to transparency and efficiency. We post our tax returns online so contributors can see exactly how their money helps the animals. What kinds of projects does Help Animals India fund? The groups we support in India are engaged in a wide range of vital animal protection activities. Their projects range from animal birth control and vaccinations to reduce overpopulation and disease among street dogs and cats; to operating shelters and sanctuaries for almost every kind of animal, from cats and cows to monkeys and elephants; to investigating cases of animal abuse and instigating action by the authorities; and to providing on-the-ground rescue and relief for animals affected by natural disasters. You can learn more about our groups' projects by visiting our projects page, following us on Facebook, Twitter and YouTube and subscribing to our newsletter. How long has Help Animals India been in operation? Help Animals India was founded and registered as a 501(c)(3) USA charity in 2008. Prior to that, Help Animals India Founder and President Eileen Weintraub had been deeply involved in helping India's animals since 1998. She is a lifelong humane volunteer. Does Help Animals India help only animals, or do you help people as well? While our primary mission is to improve the welfare of animals, in doing so we also help people in India through employment, free vegan meals for the hungry, reducing the risk of rabies and as a provider of humane education. In particular, we are very sympathetic to the animal rescuers themselves, the burdens they face and their very difficult lives as they often go up against societal norms. These are the people we directly support when we help Indian charities. Animal charities supported by Help Animals India provide employment for staff who depend on their wages to feed their families. These may be the only employment opportunities in these typically poor communities; and for women, their first chance to work outside the home. The opportunity for a career that promotes kindness towards animals is invaluable. Vegan meals served to school children in Nepal. By funding the vaccination of street dogs, Help Animals India is reducing the risk to people of rabies. Every year, approximately 20,000 Indians die of rabies – 36 percent of rabies deaths worldwide – according to the World Health Organization. Our partners’ work is reducing that enormous death toll. Case in point the Help Animals India sponsored Animal Birth control camp came across this little girl who was very unfortunately bitten in a village (while going in the fields for open toilet!) The parents were completely ignorant as to what was to be done in this situation. They guided them in the right direction during our team’s visit and she was taken to the hospital to be given rabies shots. Our team , through Sarvodaya Sevabhavi Samstha, arranged an awareness campaign in the school she is attending. Help Animals India also works with groups that educate people about the humane treatment and responsible care of animals. Human behavior is a key to reducing animal suffering and increasing animal welfare. Programs by our funded groups help individuals care for street animal populations in their areas and teach the basics of companion animal care in a culture where the concept of having “pets” is relatively new. I live outside India. 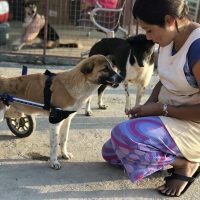 How can I become involved with Help Animals India or just help animals in general? You can donate to Help Animals India. If you pay taxes in the USA, your donation is tax-deductible. You can volunteer. If you have any special administrative, grant-writing, blogging or other skills, please contact us. You can spread the word. Pass out our flyers, refer people to our website, share our Facebook, Twitter and YouTube content. Get involved with animal advocacy groups in your area. Choose a vegan diet and lifestyle to create a more compassionate world for animals everywhere, including India (see “How does my diet and lifestyle impact India’s cows?” below). I live in India. How can I help? Volunteer for one of our charities or any other animal charity in your community. The organization We For Animals maintains an extensive list of animal welfare organizations in India with links and contact information. Adopt a rescued animal from a shelter near you and provide a loving, lifelong home. Make your friends and family aware of the plight of animals in India and encourage them to become part of the solution. Choose a vegan diet and lifestyle to create a more compassionate world for animals across India and everywhere else (see “How does my diet and lifestyle impact India’s cows?” below). Finally, if you see an animal in distress or are aware of animal abuse or neglect, please contact the nearest animal welfare organization in your area. We For Animals has a helpful list of Do’s and Don’ts for when you encounter an animal in need. What are “community dogs” and “community cats”? The term “community dog” refers to dogs who live on the streets, which include semi-feral and abandoned strays. Some are “adopted” by people in the neighborhood who feed and protect them. Some are loved and tolerated; many more are feared and harassed – even cruelly killed. The most common type of community dog is the Indian Native Dog. A growing number of street dogs are pedigree dogs (purebred dogs like the Pomeranian shown here) who were purchased from breeders but have been abandoned by their owners due to illness, injury, old age or simply because their owners moved or lost interest. The abandoned pet dogs are now mixing with the Indian Native dogs. While the native dogs may be able to survive on the streets, the abandoned pet dogs cannot. 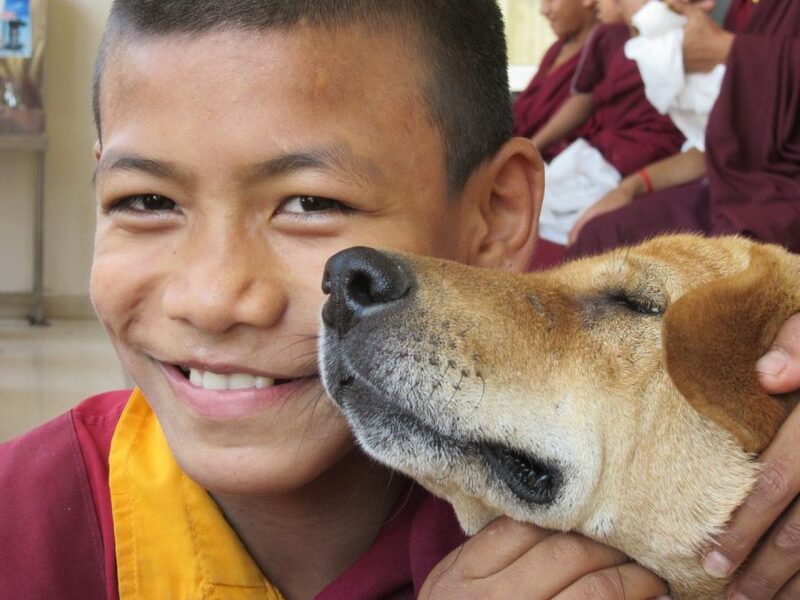 A young monk with a community dog in S. India. This is why ABC (animal birth control) and vaccination programs funded by Help Animals India are so important. How serious a problem is rabies in India? What is Help Animals India doing to improve the situation? The World Health Organization estimates that rabies kills about 20,000 people a year in India – 36% of rabies deaths worldwide. Help Animals India is heavily involved in combating this serious problem by funding the vaccination of street dogs and ABC (animal birth control) programs to reduce the number of hungry, suffering, and sometimes dangerous dogs on the streets. Aren’t all cows in India sacred and well treated? The cow is sacred to the millions of Hindus in India, yet cows face many serious challenges in modern India. 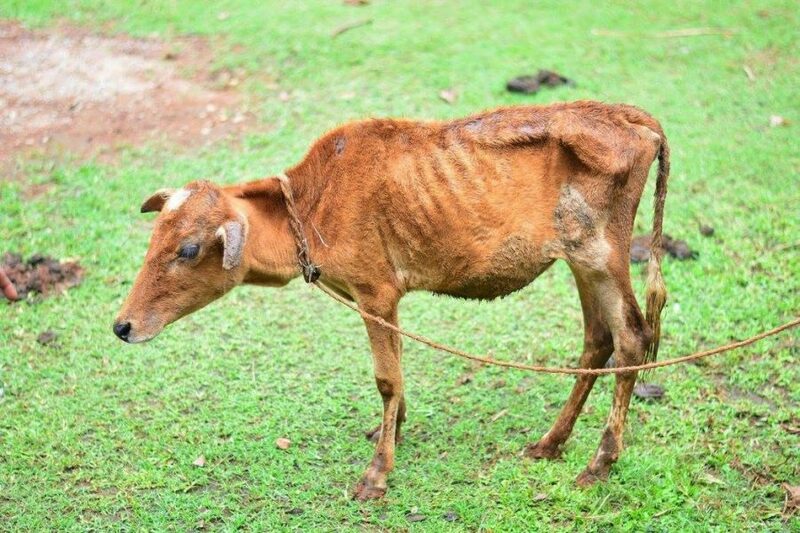 Dairy cows who no longer produce milk, and male calves and bulls who obviously are incapable of producing milk (in ancient India, bulls were used for ploughing but they are in much less demand in urbanizing modern India), are often abandoned in the streets. Furthermore, due to their sacred status, even “owned” cows that have not been abandoned are allowed to roam free in the busy streets of India where they jostle with vehicles and sometimes are injured or killed. Male calves, who don't produce milk, aren't "needed" in the dairy industry. They are commonly neglected and abandoned. Cows often forage for food in garbage dumps where they end up ingesting foreign objects and plastic bags that accumulate in their guts, with painfully disabling or deadly results. Help Animals India funds programs like Karuna Society's Plastic Cow Project, where veterinarians surgically remove the tons of deadly plastic that have accumulated inside a cow's stomach. Cows also face illegal slaughter in India or illegal transportation to slaughter plants in neighboring countries or the few Indian states where slaughter is legal (notably Kerala). While there are approximately 3,600 slaughterhouses operating legally in India, it's estimated that over 30,000 slaughterhouses operate illegally, subjecting the cows to horrendous treatment. On their way to slaughter, the cows are transported over long distances under extremely cruel conditions. While police and organizations are making some progress in shutting down these illegal slaughter and transport operations, the problem is on the rise because nearly all the cows are a byproduct of India's growing (and legal) dairy industry. The nation's 400 million vegetarians (a third of the population) are great consumers of milk and ghee (clarified butter), from cows who will eventually be sent to slaughter. One bright spot is the growth of veganism in India. Another bright spot is the example set by Karuna Society and other cow sanctuaries which keep the unwanted cows and bulls for life. How does my diet and lifestyle impact India’s cows? Is there a connection with drinking milk and wearing leather in my own country? India is one of the world’s top milk-producing countries. As discussed above, nearly 100% of the cows who end up being illegally slaughtered in India or illegally transported to abattoirs in the two states that do allow slaughter (under extremely brutal conditions) are castoffs of the Indian dairy industry. India is also among the world’s top leather producers. Leather from India’s cows is exported to countries around the world, including the United States, Canada and the European Union. The demand for leather and dairy is so high that the illegal transport and slaughter of India's cows continues, despite the best efforts of animal protection organizations. When you purchase a leather or suede jacket or belt or shoes, there is a considerable chance it's a byproduct of extreme animal cruelty in India. (Regardless of where the leather comes from, it always is a product of brutality.) Removing leather from your wardrobe and dairy from your diet is one of the most important ways you can respect the sacredness of cows, whether in India or anywhere else. What is the situation for elephants in India? Please click here to read about the important work being done for India's elephants by Compassion Unlimited Plus Action (CUPA) with support from Help Animals India. Isn’t the government of India a supporter of the humane treatment of animals? Yet, as with so many other countries, fine words, laws and regulations are one thing; actions and enforcement are another. As a result, it's the dedicated animal protection groups like those supported by Help Animals India who are truly at the forefront of fulfilling the people of India's duty to have compassion for all living creatures.